I'd like to refer to myself as a sentimentalist. For years, I considered myself a traditionalist and truth be told, I still hold traditional very close to my heart. I can completely understand when my brides say, " I want him to see me for the first time when I'm coming down the aisle." Honestly, I get it and if that is something TRULY important to you, then stick with that, this is your day! With that said, in the last two years I've had the opportunity to serve nearly 75 couples and a first look has become a FAVORITE of mine. From a photography standpoint, a first look allows us to cut into some of the stress of keeping you and your groom from seeing each other, having the opportunity to get some of those formal photos done. This is especially important if you have a large bridal party and even more so important if you're having a late fall wedding as we will not have as much time with the sun. Technicalities aside, its not uncommon for your wedding day to bring up some nerves. This doesn't mean you have cold feet, and your second guessing your choice. 9/10 its more that we're nervous to be in the spotlight in front of so many people, nervous that something could go wrong, nervous we could trip in those heals. The irony is, your partner, is probably the person that at some level you depend on to help calm you down, am I right? From experience, the couples who have chosen to have a first look, even a first look/no look (what the heck is that, you ask? A first prayer, meeting in a sense without seeing each other) seem to be SO much more relaxed. They get to share this intimate moment of just the two of them before everything starts. It becomes even more special, as its one of the few times throughout the day that you'll have that opportunity. When doing a first look, I like to ask my couples who they would like there. Often you choose just the two of you and of course, myself and my assistant. We do our best to make the moment as secluded as possible and we will capture your first look and then give you some time with one another to just be. This is often the last moment you'll have together before you're husband and wife and there is something SO special about that. 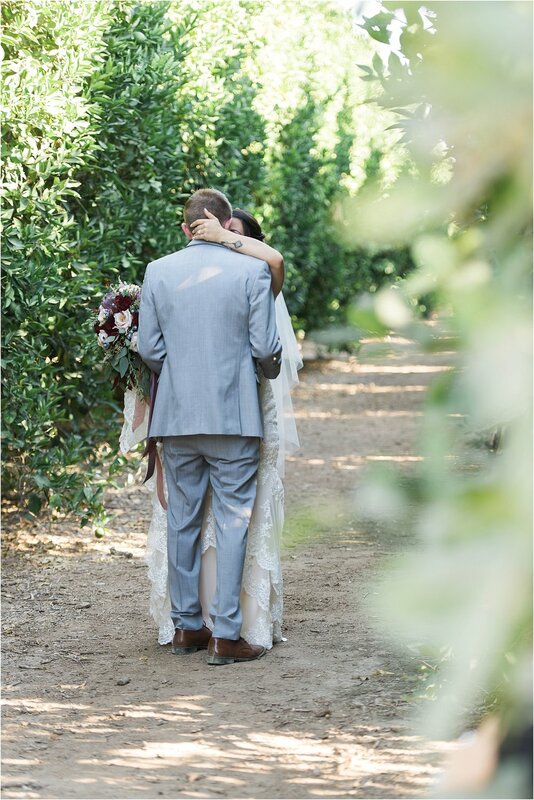 Here's a few from Rosie and Kyle's beautiful wedding at Lorimar Winery!